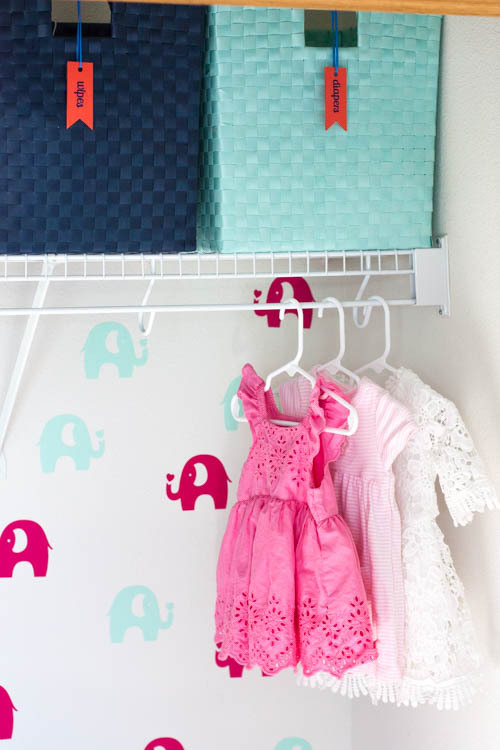 Practical tips and tricks for organizing a nursery closet! 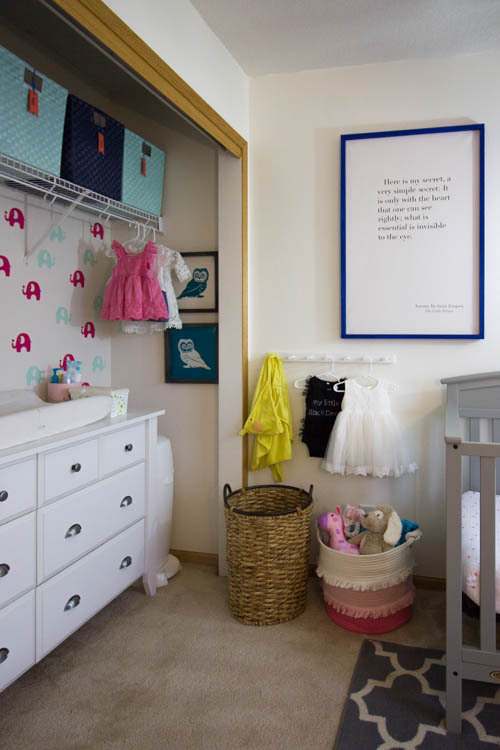 Learn how a real mom placed a dresser inside a nursery closet and used the dresser as a changing table to maximize space. It’s been nearly eight months since I first organized the nursery closet, so it’s about time I share all of the details! 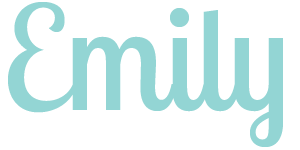 I chose not to blog about it right away last fall because I wanted to test the organizational systems for a while to see how they truly functioned for our family. And I’m happy to report that this space is working marvelously at keeping life organized with a baby! This closet is definitely the hardest working spot in the entire room. It is packed with storage space for baby clothes and supplies, plus it doubles as a super useful changing station. Read on for all of my time-tested tips for organizing a nursery closet! This post is sponsored by Homemakers Furniture. See my disclosure policy for more information. Thank you for supporting the brands that support The Small Stuff Counts! A winner will be randomly selected on Monday, July 2nd! Since this bedroom is pretty small, I turned my attention to the closet as a prime opportunity to add storage. Adding our white dresser inside the closet has been such a good decision, so when Homemakers Furniture asked me to share more about the organizing systems I’m using in the nursery, it was an easy ‘yes’. The dresser I purchased from them is the star of the show in terms of organizing our nursery! 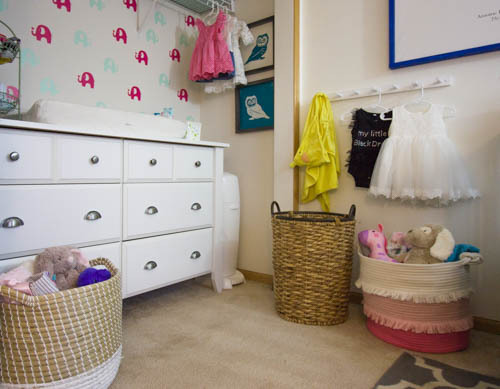 One of the best ways to gain square footage in a small nursery is by removing the closet doors. Hanging baby clothes from the single rod would leave a lot of wasted space underneath. Plus, who really has time to hang all of those tiny clothes?! Trust me, you want a lot of closed storage to contain all of the baby things. Removing the closet doors will give you space to slide in a full-size dresser. The additional drawers add a ton of storage for baby clothes and supplies, and the top of the dresser makes the perfect changing table. Measure the width of your closet before you go dresser shopping so you know what size will work in your space. I highly recommend leaving just enough extra space for a Diaper Genie to fit beside the dresser. Most closet doors can be removed by unscrewing a couple screws. Tape a plastic baggie with the screws and any other hardware to the doors and store them in your basement so you can put them back in place down the road. There are some gorgeous changing tables out there, but I didn’t really have room to add another piece of furniture to our small nursery. So I opted to use a dresser that could double as a changing table. Using a dresser as a changing table will save space if you are also working with a small room. If you are thinking about using a dresser as a changing table, look for one that is at least 18 inches deep. This will allow enough room for a changing pad to sit safely on top. I found this pretty Sauder Shoal Creek Dresser at Homemakers Furniture and it was just the right size! Pro Tip: Keep a small measuring tape in your purse to quickly measure furniture in the store. If shopping online, always double-check the product dimensions before ordering. Most changing pads have a non-slip grip surface on the bottom. Since you should never leave your baby unattended on the changing pad, the non-slip grip is enough to hold it in place. 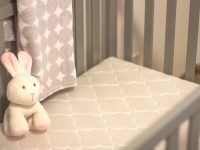 But you could also secure the pad with a few velcro Command strips, or purchase a wooden dresser topper with compartments designed to hold the changing pad and diapering supplies. When organizing a nursery closet, it’s important to strategically place high-use items within easy reach. One of your hands will be holding your baby on the changing pad at all times, so all supplies need to be within an arm’s reach. To the right of the changing pad, I keep a container of wipes and a repurposed jar that holds hand sanitizer, lotion, and balms. A tiered basket to the left of the changing pad holds a handful of diapers, hair bows and a few little toys to entertain my squirmy baby. Consider using part of a top dresser drawer for storing extra diapers (because you can never have too many!) along with medicines and hygiene items. Also, don’t overlook the placement of a trash bin or Diaper Genie! There was just enough room to the right of our dresser to slip in a Diaper Genie and I’m so thankful we have it there. The beauty of all of these large dresser drawers under the changing table is that it makes outfit changes quick! 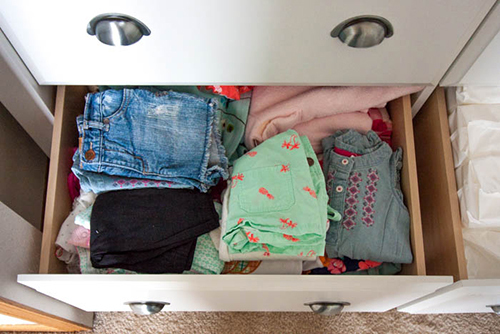 Organize baby clothes inside the drawers, strategically placing everyday clothes and pajamas within easiest reach. I made simple drawer dividers to neatly organize all of the tiny baby clothes in rows. The drawer dividers will be easy to adjust as Chloe’s clothing gets larger. I also added small labels inside each drawer so we know exactly where everything belongs. Take an in-depth tour of every single drawer of our organized nursery dresser in this blog post. 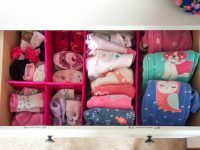 You’ll see how I organized baby clothes for easy grabbing and how I used labels and DIY drawer dividers to keep everything neat and tidy. Long-term, it’s best to neatly organize outgrown clothing in plastic storage tubs or sell/donate them. 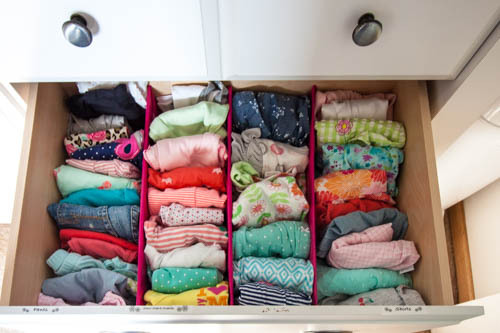 But when you come across too-small clothes as you’re dressing your baby, it’s really nice to have a spot to stash them so they don’t end up right back in the dresser drawer taking up space. I lined the existing closet shelf with storage bins and labeled one specifically for outgrown clothing. That’s where I toss anything that’s too small. Once that bin fills up, I sort through it and move those clothes to storage tubs. I knew babies grew fast, but man do they ever! I’m constantly digging out larger sizes of clothing. I highly recommend designating a dresser drawer or bin on the closet shelf for holding clothes one size bigger than your baby is currently wearing. There was enough room in our dresser to designate a bottom drawer for the larger sizes of clothes that we received from baby showers into one of the bottom drawers. They are categorized by size and I can quickly grab the next size when it’s time to move those bigger clothes into the upper drawers. Having larger clothing right here in the closet is much more convenient than having to rummage through storage tubs in the basement. I think if Chloe’s larger clothes weren’t so convenient to grab, I’d procrastinate getting them out and she’d miss the opportunity to wear some of them. I’ve also found myself sifting through this drawer often to get an idea of what types of clothing she could still use in those larger sizes (extra handy if Grandma is going to garage sales and wants to know what clothes to look for;) ). By adding this dresser inside our nursery closet, I was able to create enough storage space to hold all of the baby items we use every day with room to spare for surplus items. Now that’s what I call an organizing win! Since buying diapers and wipes in bulk makes a lot of financial sense and you might as well since babies go through so many, you’ll want to plan for where to store them all. I buy ours at Sam’s Club and immediately take them out of their boxes when I get home. One of the bottom dresser drawers holds extra sleeves of diapers and extra packs of wipes. 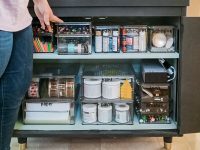 This makes it easy to restock the changing station on top of the dresser as well as the diaper changing caddy in our living room and the stash at daycare. The bins on the closet shelf also store extra supplies, primarily diapers and wipes. One of the bins stores toys from baby showers and Christmas that Chloe is still too young to play with. Hooks are super helpful for hanging towels, pajamas and clothing so it doesn’t end up in piles on the floor. Consider hanging hooks low so your child will be able to reach them when they get a little bigger. I added hooks to the right of the closet for Chloe’s towel to dry in between baths. I also have a few of my favorite dresses displayed here for now because I just can’t stand to pack them away! 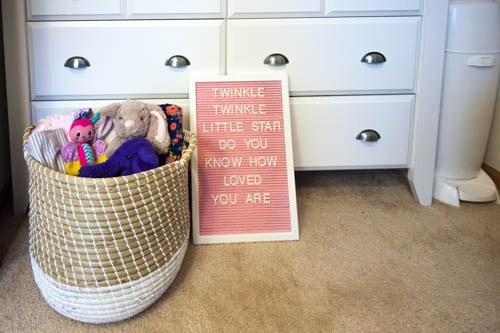 Although these baskets aren’t technically inside the nursery closet, they are worth mentioning because they are key to keeping things organized. I’ve had that pink basket in here for a while now and it’s worked so well for containing little toys and blankets. I found the neutral/white basket at Homemakers Furniture and couldn’t resist – one can never have too many baskets! After all, babies love to dump things out of them ;). Considering using a dresser as a changing table? This is a great way to save space in a small nursery. Before you go dresser shopping, measure the width of your space. You’ll also want to look for dressers that are deep enough to fit a changing pad on top (the dresser I bought is 18 inches deep which is perfect!). Furnish your entire nursery with beautiful dressers, cribs, rockers, bookshelves and more from Homemakers Furniture. 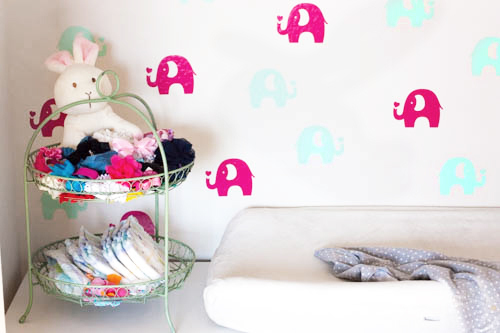 Shop their baby and kids section online and you’ll be on your way to an organized nursery in no time! 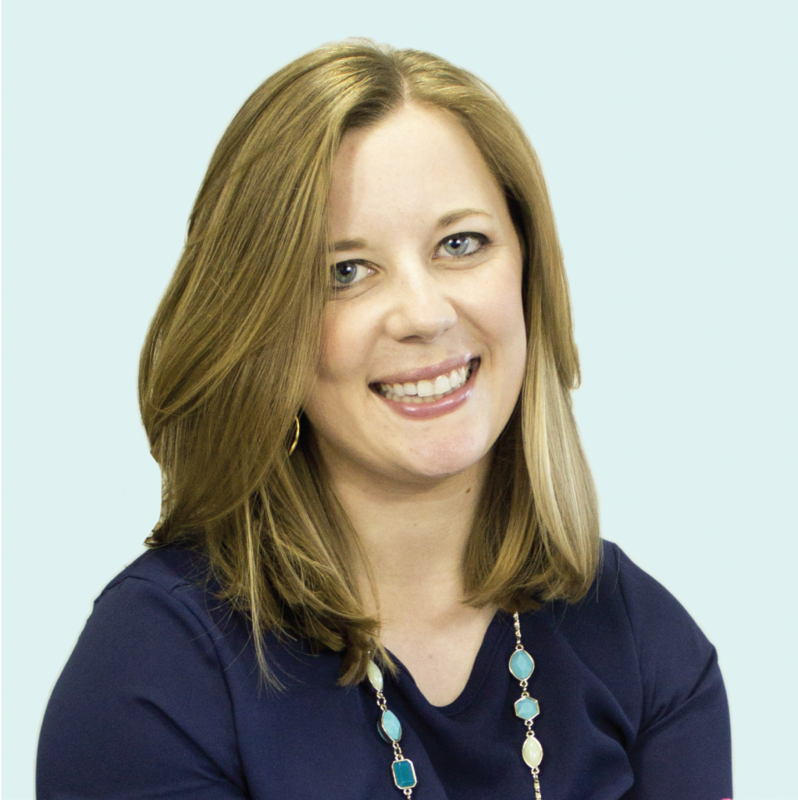 I hope these tips help you organize your nursery closet!